Infrastructure Australia's (IA's) recent release of its Future Cities paper included 15 recommendations which overwhelmingly called for the Federal Government to play a greater role in the growth of our cities and similarly, the recommendations called for a paradigm shift. The federal agency like its state counterpart, Infrastructure Victoria, highlighted road pricing and the need for it to change and there were other cross-over themes like sweating existing transport & social infrastructure assets as well as calling for an end to the business-as-usual development of Australia's cities. Future Cities also calls on governments to shift toward greater investment in public transport. [Recommendation] 8: Australian governments should increase investment in public transport infrastructure in cities experiencing significant population growth. Investment in mass transit is crucial to reducing congestion, increasing accessibility and reducing the rate of emissions growth. This is particularly relevant for higher density areas where space is limited. Walking and cycling as principal means of transport within centres and to transport nodes. In Melbourne's case, the first dot point is something that needs to be explored in greater detail. For instance, there's an obvious key centre that the Public Transport network serves incredibly well and one that has a good 20 years worth of new investment that could occur to increase capacity. That's the CBD and adjacent areas along with the well-publicised Network Development Plan, but what other places in metropolitan Melbourne could we justifiably call a 'key centre'? The Victorian Planning Authority is a good start - it designates Monash, La Trobe, Sunshine, East Werribee and Dandenong South as National Employment and Innovation Clusters. These are areas which have high amounts of existing employment spaces as well as serving as regional precincts for other social infrastructure & services like hospitals and education facilities. Coincidentally, the Victorian Planning Authority is set to complete the major masterplan work it has been conducting over the past two years at the Monash, La Trobe and Sunshine National Employment and Innovation Clusters. As part of testing the performance of the transport network against Infrastructure Australia's three city growth scenarios, various road and public transport projects were used in the models - the West Gate Tunnel, Melbourne Metro, Level Crossing removals - and curiously even projects like the East-West Link. One large public transport project which was not included in the models, despite a good deal of initial information being in the public domain thanks to Infrastructure Victoria, was Melbourne Metro 2. Nevertheless, it's also useful to contrast the state of public transport projects north of the Murray with those that are in the public domain down here. 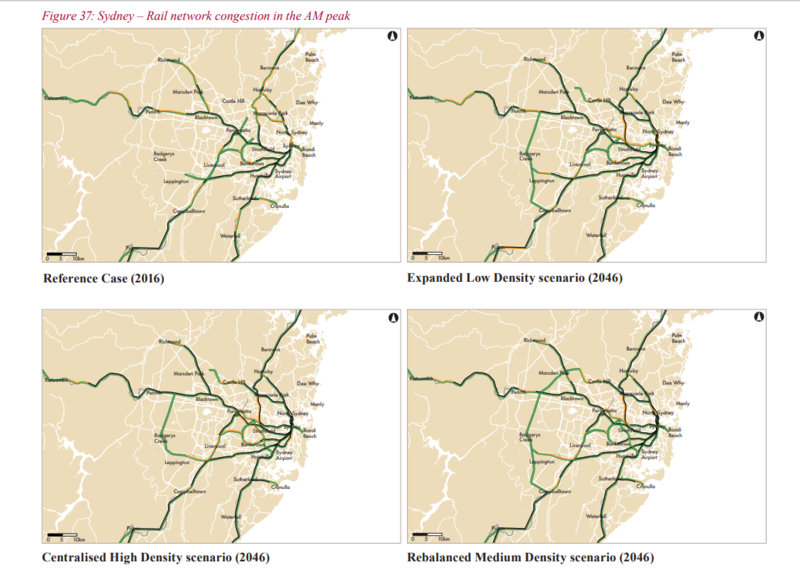 The Greater Sydney Commission's three-city vision stands out in those rail maps above, especially the re-balanced medium density scenario (bottom right tile) with North-South and East-West rail lines interconnecting in the traditional CBD, Parramatta and at Badgery's Creek. 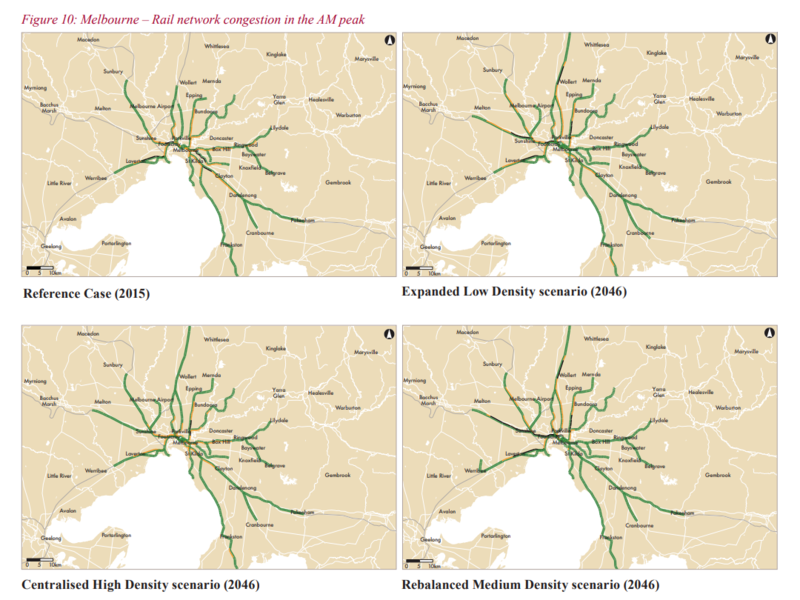 Sydney's rail network allows for train-to-train connections outside the CBD already, however the network, should it be built as outlined in the medium density scenario depicted in the tile on the bottom right, would take that to the next level. Melbourne however? Still much of the same muchness, despite well-known centres actively being master-planned right now by the VPA. This is not a centralised versus decentralised growth argument - there are lots of jobs as well as land to create space for more in the inner-city and there are many hundreds of thousands of jobs equally located outside of central Melbourne. Our transport network already services the city & suburban job market, however work is underway to concentrate even more jobs in suburban areas where the Public Transport network does far less of the heavy lifting. The Infrastructure Australia report makes mention of generic bus and tram network improvements and there are no doubt many high profile projects involving those public transport modes that will see the light of day over the next few decades. Melbourne's heavy rail network will undergo major changes - Infrastructure Australia included the City Loop changes into its list of modeled projects - but it's basic suburbs to city function remains constant. Infrastructure Australia says that government should focus more on public transport that links key centres, perhaps it's time to finally do a study that looks at partial or full orbital rail corridors in the inner and middle suburbs.